Umair bin Waheed was born in Karachi, Pakistan where he received his early education. After completing an undergraduate degree in electronic engineering, he received the prestigious Erasmus Mundus scholarship to pursue double degree Masters at Politecnico di Torino, Italy and Université Catholique de Louvain, Belgium. Inspired by the vision of KAUST to create a modern house of wisdom, Umair then joined the university to pursue Ph.D. under the able supervision of Tariq Alkhalifah. After completing Ph.D. in 2015, he joined the Department of Geosciences at Princeton University as a postdoc. 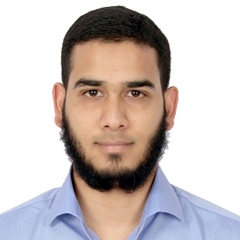 Since finishing his postdoc in 2017, Umair has been at the College of Petroleum Engineering and Geosciences, KFUPM as Assistant Professor. In addition to conducting scientific research, Umair has always been curious about communicating scientific findings. During his time as a postdoc at Princeton, he worked with the Princeton Writing Program (PWP) as a Writing in Science and Engineering Fellow under the mentorship of Judy Swan. He received intensive training in teaching writing at the PWP. Later he taught courses on scientific writing to graduate students from across disciplines at Princeton. Encouraged by the positive feedback from his students, Umair now conducts workshops helping students across different universities to effectively communicate their scientific discoveries through writing. Waheed, U., & Alkhalifah, T. (2017). A fast sweeping algorithm for accurate solution of the tilted transversely isotropic eikonal equation using factorization. Geophysics, 82(6), WB1-WB8. Waheed, U., Stovas, A., & Alkhalifah, T. (2017). Anisotropy parameter inversion in vertical axis of symmetry media using diffractions. Geophysical Prospecting, 65(1), 194-203. Waheed, U., Flagg, G., & Yarman, C. E. (2016). First-arrival traveltime tomography for anisotropic media using the adjoint-state method. Geophysics, 81(4), R147-R155. Waheed, U., & Alkhalifah, T. (2016). Effective ellipsoidal models for wavefield extrapolation in tilted orthorhombic media. Studia Geophysica et Geodaetica, 60(3), 349-369. Waheed, U., & Alkhalifah, T. (2015). An efficient wave extrapolation method for anisotropic media with tilt. Geophysical Prospecting, 63(5), 1126-1141. Waheed, U., Yarman, C. E., & Flagg, G. (2015). An iterative, fast-sweeping-based eikonal solver for 3D tilted anisotropic media. Geophysics, 80(3), C49-C58. Waheed, U., Alkhalifah, T., & Wang, H. (2015). Efficient traveltime solutions of the acoustic TI eikonal equation. Journal of Computational Physics, 282, 62-76. Ibanez-Jacome, W., Alkhalifah, T., & Waheed, U. (2014). Effective orthorhombic anisotropic models for wavefield extrapolation. Geophysical Journal International, 198(3), 1653-1661. Ketcheson, D., & Waheed, U. (2014). A comparison of high-order explicit Runge–Kutta, extrapolation, and deferred correction methods in serial and parallel. Communications in Applied Mathematics and Computational Science, 9(2), 175-200. Waheed, U., Alkhalifah, T., & Stovas, A. (2013). Diffraction traveltime approximation for TI media with an inhomogeneous background. Geophysics, 78(5), WC103-WC111. Waheed, U., Pšenčík, I., Červený, V., Iversen, E., & Alkhalifah, T. (2013). Two-point paraxial traveltime formula for inhomogeneous isotropic and anisotropic media: Tests of accuracy. Geophysics, 78(5), WC65-WC80.